In previous posts I provided news clippings suggesting a large group of Indians would be sent to the Paris Expo. After hours and hours and days and days of research using English and French resources, U-ta-wa-un and We-no-na are the only Native Americans I find any reference to in Paris this year. The United States was financially broke as a result of the recent Civil War and hard pressed to fund a strong U.S. exhibit for the Paris Expo. I believe the plan to send 50 Natives to Paris never made it off the drawing board. Axed in the financial crisis created by underfunding. Document 1 suggests people (or at least the press) were apposed to spending government money on Indians for the Expo. A significant number of books were written about the Paris Expo, such as: “Paris in ’67; or, The great exposition, its side-shows and excursions”; “Recollections of the Paris exhibition of 1867”; “Les manuscrits anciens a l’Exposition universelle”; “Notes and sketches of the Paris exhibition”; “The great exhibition: with continental sketches, practical and humorous”; and “Promenades préhistoriques à l’Exposition universelle”. None of these writers were impressed enough to make any mentioned of America’s Indians, neither good nor bad. Therefore, it is my current belief the government did not include any Indians in the official Expo plan, but may have allowed private enterprise to do as they wished. 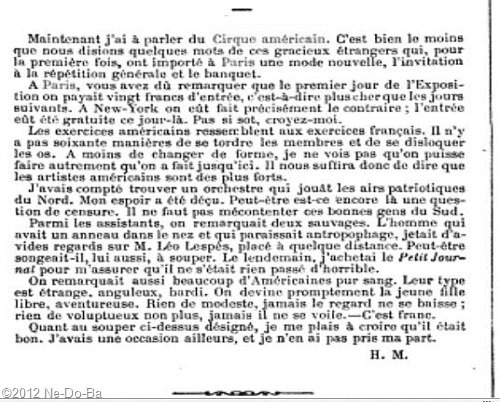 I found a college paper online written in French concerning the Paris Expo. The bibliography suggests it is properly researched, but I am unable to determine the author or school. The whole website has disappeared as of April 2013, so perhaps I was not supposed to find this. The paper discusses the indigenous people of the various nations who participated in the 1867 Paris Universal Exposition. It suggests these participants were expected to earn money to support themselves while there. Many were employees in their nation’s cafes and restaurants. Others were there demonstrating native skills and selling the products of those skills to the public. The sponsoring nations and businesses expected their people to earn their own way. No one got a free ride. I wasn’t able to learn much about the housing situation for these workers. I found no mention of special housing arrangements for the hordes of Expo worker staying in Paris for the entire Expo. Based on what I have read, I believe they were expected to procure their own housing arrangements and earn enough to pay for their own room and meals. A few may have slept in the park buildings of their country, but I doubt large numbers were allowed to live within the Expo grounds. the Indians are living in the same manner as their white counterparts at the hotel and not in a Indian village erected in the Expo Park. While not very flattering, this piece does provide a nice glimpse of U-ta-wa-un and his “wife”. Even though it does not provide any names, I have no doubt U-ta-wa-un and We-no-na are the Indians being described. Mention of the circus and the collection of teeth is a certain give-away. Sounds like my tooth pulling friend U-ta-wa-un, don’t you think? This item is dated the 26th of April. I have already determined U-ta-wa-un arrived in Harve, France with the American Circus on April 12. He may or may not have stayed in Harve with the circus until April 20 when the rest of the troupe was expected to arrive. Based on these dates, U-ta-wa-un has been in Paris for as few as 6 days or as many as 14 days. I would not expect the circus to transport U-ta-wa-un and We-no-na out of the goodness of their heart. Remember, they traveled in first class. Someone had to pay the fare and it seems extremely unlikely it was the U.S. Government. I have little doubt, the pair were expected to pay their own way and earn their own keep once they arrived. I wonder how they did that? In my first post titled “Indians in Paris?”, I introduced the first piece of evidence I found suggesting U-ta-wa-un was at the Paris Universal Exposition. The item concerned a little boat named the Red, White, and Blue on display at the Expo. The author of the item lists attractions in a manner suggesting he was naming the attractions as they appear while walking from the train station entrance towards the boat on display. The last attraction mentioned is U-ta-wa-un and it suggests he had a village. This item clearly places U-ta-wa-un solidly within the Expo Park. But no where else have I found any reference to a village. Did the author make it up? Maybe, but everything else mentioned can be verified as real. Did the village really exist? Maybe, but I find no other evidence of it. So, at this point, the question of a village is unanswered. From my research I have learned the Expo Palace building and the Park was still very much under construction on opening day April 1st. Construction and unpacking was still on-going in May. During the early weeks the weather did not co-operate either. I wonder if U-ta-wa-un and We-no-na built a wigwam for display as well as to keep themselves out of the weather. Perhaps they built it where something else belonged and it came down once the rainy weather finally cleared out and construction finished up. It is a plausible theory, but nothing more. The illustrations I shared in the Images from Paris post with the caption “The Redskins of the Universal Exposition” also suggests U-ta-wa-un and We-no-na participated in the Exposition. There is no question U-ta-wa-un and We-no-na were in Paris. However, after all my research, these two items are the only evidence I can find that our friends actually participated in the Exposition. Perhaps things didn’t work out well for them in the Expo Park. Perhaps the U.S. Commissioner was not impressed with their show and revoked their admission pass. Perhaps the rain and lack of crowds in the early weeks dampened their profits too much and they moved on to more profitable activities. A group of American showmen (Avery Smith, G. C. Quick, J. J. Nathans, G. R. Spalding, and David Bidwell) anted up $150,000 to send a circus to the affair [the Paris Exposition], and chose James and Clarence Robinson to head the bill. They had a wooden-walled and canvas-topped building made in Albany, which they shipped overseas, but which they were forbidden to use by the authorities. They rented a theatre to good effect, and had full houses for their entire run. … we are to have the grand combined circus companies of Spalding, Bidwell & Co. who will certainly excel all others, for the Americans have gained a reputation for superiority which is no longer contested. The American Circus is not in the Champs de Mars, but at the other end of Paris, and on the first two days of last week took 11,000 francs. This does not strike me as a very good business. theatre DU PRINCE imperial american circus. The backers of the circus invested a lot in the custom construction and transportation of a portable amphitheater to France, but never had a chance to use it. Napoleon was rebuilding the city of Paris and had implemented a building code which forbid the use of wooden structures for public buildings. The circus was forced to hire the Imperial Prince Theater. This location proved ideal since it was constructed specifically for use by equestrian based shows. My circus research indicates top performers such as James Robinson were paid $250 to $350 a week in this time period. Anyone named in promotional materials probably received at least $100 a week. Fill-ins, animal handlers, and other workers generally received $25 per week. It appears the circus of this time period could provide a respectable wage to troupe members as long as the outfit stayed in business. Now I have to talk about the American Circus. It’s definite that we must say a few words about these graceful foreigners who, for the first time, have imported a new fashion, the invitation to the dress rehearsal and the banquet. In Paris, you have to point out that on the first day of the exposition one must pay twenty francs to enter, that is to say more expensive than the following days. In New York, they had done the exact opposite; admission was free that day. Not so silly, believe me. The American exercises resemble the French exercises, there are not sixty manners of this form, I don’t see how one can do otherwise than has been done so far. Therefore it suffices to say that American artists are stronger. Among the assistants, we noticed two savages. The man with a ring in the nose and who appeared to be cannibalistic, was staring at Mr Leo Lespes’ place a short distance away. Perhaps he too was thinking to himself of supper. The next day I bought the Petit Journal to reassure myself that nothing horrible had happened. We also noticed a lot of pure American blood. Their type is strange, angular, bearded. One promptly wonders about the young unattached, adventuresome girl. Nothing modest, never looks down; nothing voluptuous either, never veils. -It’s honest. As for dinner designated above, I like to believe that it was good. I had an opportunity elsewhere, and I did not take my hand. Oh my, it certainly does look like U-ta-wa-un did sell out to the circus! I now have reasonable evidence that U-ta-wa-un and We-no-na were performing with the circus. Actually, I have a much better piece of evidence I am saving for my next post. It appears the circus stayed for the entire Expo, which ended October 31. I find they moved to London afterwards and appear there for several weeks in November and December. I found a wonderful review of this circus (clearly mentioning they performed in Paris during the Expo) in a London newspaper. There is no mention of Indians in the London circus. However, Marleah Kanistanaux (who I believe is the same person as We-no-na) mentioned in one of her advertising flyers that she had visited Paris and London, so it is quite possible they did stay with the circus and perform in London. It is possible the circus visited other European cities before returning to the U.S. I find no evidence the circus returned to the states as a unit. London ads suggest the circus has changed some of it performers. I see names that were not included in Paris notices. The following year and several years after, a circus with a similar name but entirely different management performed in Europe. I know some of the Paris performers were working with other shows the following year and at least one performer stayed in Europe about two years before returning to the U.S. This suggests the Paris circus probably disbanded in Europe and then perhaps reformed with different financial backers. I have not been able to determine when U-ta-wa-un and We-no-na returned to the states. Perhaps some day I will locate a passenger list for their return trip, but with a large date range to search it will not be easy to find them. I have lots of items that still need deeper research and as usual, I end up with new questions and few answers to old questions. Still, I have been able to piece together a good section of the puzzle and this should help me locate more pieces. It is always easier to locate pieces when you have some idea what you are looking for! This writer is summing up his impression of the Paris Universal Exposition. I can’t help but wonder if his “quacks and toothdrawers” is a reference to U-ta-wa-un? I believe my research demonstrates U-ta-wa-un and his companion We-no-na arrived in Paris with the American Circus. While in Paris they were present for at least a few days or weeks within the grounds of the Exposition. They may or may not have built one of more “Indian” structures in the Expo Park. At some point they began performing with the American Circus. This may have been planned in advance or it may have happened as the result of a need for a steady income. It is always possible they were in the Expo Park simply to promote the circus. The Park would have been a great place to promote outside events. If this is the case, it may not have been long before they were booted out by the American Commissioner. This line of research has been fascinating. I have developed a keen interest in the Exposition, the American Circus, and of course, my friends U-ta-wa-un and We-no-na. Since, I have not learned anything about We-no-na, my work is not done. Before long I will be an expert on the subject of Indians in Paris. Even though I am finishing up this series, I will be continuing the research (probably for the rest of my life). I never would have dreamed that researching an Indian family in Stockton, NY would take me on a trip to Paris? Don’t miss my next post. I have a wonderful surprise!